The Gravel Bag is one of the most common ways to protect inlets, curbs and site drains. Designed to block and filter sediment, these bags help protect drains from displaced sediment around your site. Bags are offered in a standard orange or green color and sold as individual bags or one continuous roll. 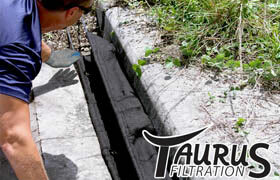 See more Stormwater Filtration Drain Guards. If you have questions, please don't hesitate to call us at 1-772-646-0597 or request a price quote. Individual models are a great option for any construction site. Bags are sold by the box and may be filled with as little or as much gravel as is necessary for your site. Roll models are perfect for inlets and curb side street drains. For pricing information, please don't hesitate to call GEI Works at 1-772-646-0597 or request a price quote.